Another purchase from my late-90s open-minded phase. 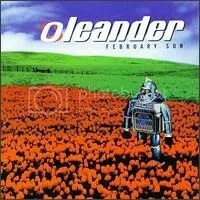 Oleander are pure alternative rock, “post-grunge”, if you will and I got hooked on their singe “Why I’m Here”. If that was a new single today, I’d probably like it, but not give the album the time of day. I’m glad I did take the chance on them at the time though because as far as alternative rock goes, this is pretty good and melodic enough to keep m interested. I’m not really a fan of Thomas Flower’s voice, but I guess it’s the typical alternative rocker/whiner voice. This was the band’s major label debut and six of the songs were previously released on their 1997 indie release (including “Why I’m Here”), Shrinking the Blob. Stuff like that really ticks me off when bands just re-record their indie stuff for major labels, Godsmack and The Last Vegas spring to mind. My biggest memory of this album is listening to it while I got majorly into playing my old NES again and playing Baseball Stars (STILL one of the best games ever made).